Your clients will enjoy the flavor and fragrance of a fresh roast ground coffee blend with its intense aroma and timeless intact flavor right in your cup. Our ground coffee blends are produced to give to your clients the perfect cup of espresso at home or at work. Our coffee are packed in vaccum bags to maintain all their fragrance and aroma in time. We offer a wide range of select blends to quench your coffee craving any time of the day. Our ground coffe are selected to satisfy your clients and make your business easier. The products distributed by De Roccis are reliable and consistent. They are designed to meet the demands of a wide audience. 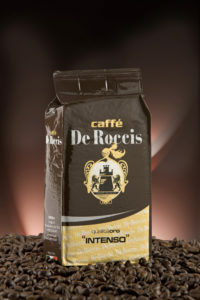 Mix of best coffees with a delicate flavor and rich fragrance. Blend with sweet aroma and fragrance perfect for home use. Suitable for either stovetop espresso maker or espresso machine. Your everyday coffee just right for the entire family. Its aroma remains well defined even with milk.